Very simple and inexpensive scanning laser rangefinder systems have been developed by Joe Paradiso, Josh Strickon, and the Responsive Environments Group at the MIT Media Lab for use as a precise gestural interface in front of a "smart surface". Our current device works by detecting the phase shift between the emitted laser and the detected reflection off of a hand. 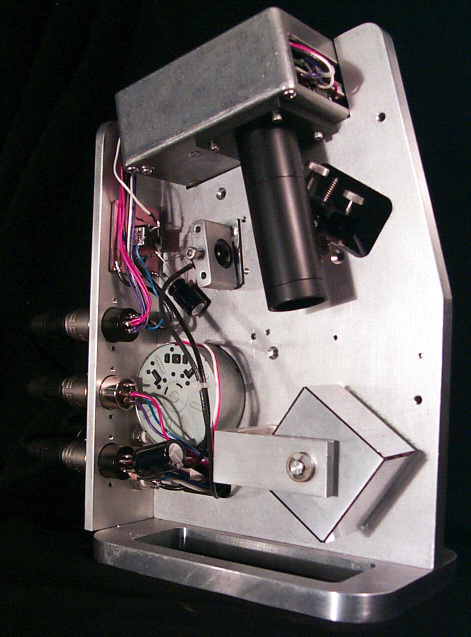 We scan a 5 mW diode laser beam across a 90 degree sensitive region at up to 30 Hz. An AGC compensates the received gain for variations in reflection strength, and the demodulation filter allows hand-sized objects to be detected several meters away, while suppressing noise and background light. A simple microprocessor digitizes the incoming data over every scan, locates peaks in the intensity data corresponding to different objects, and outputs the angle and range information for each one over a serial connection. The signals are very clean, as you can see in this image, which shows a demodulated photodiode scan (the two peaks correspond to two hands); vertical is reflection strength and horizontal is scan time (or mirror angle). At the power levels and scan rates we are running at, our system is eye-safe, and essentially provides a "touch screen" for a large projection display. Unlike conventional touch screens, however, this system can track several hands simultaneously (provided they don't occlude one another). In contrast to computer vision systems, our 2D scanner measurement is unambiguous (both range and angle are measured by one compact device; there is no need for multiple cameras) and unaffected by background light; only the laser reflection is sensed. In this video clip (4.9 MEG MPEG), MIT graduate student Josh Strickon demonstrates a musical mapping that he has quickly written, where drum sounds and background voicings vary as he moves his hand around the area above the projection screen. Two hands will start an arpeggio, and the distance between them adjusts the cutoff of a lowpass resonant filter. The rangefinder used here is our earliest 1997 prototype. In this video clip (20.2 MEG MPEG), MIT graduate Pete Rice demonstrates his originally mouse-driven program "Stretchable Music" ported to the laser rangefinder, as shown in the installation that we did at SIGGRAPH 98. Here's a video (7.6 MEG Quicktime) showing random users interacting with this system at SIGGRAPH 98. 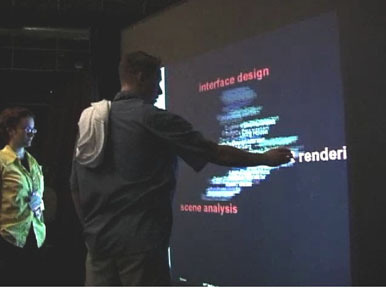 A Quicktime video is posted here showing LaserWho running at SIGGRAPH 2000 in New Orelans in July, 2000. A drawing is posted here that shows the new design of the scanning heads currently being built. Actually, we've finished building it and it's in common use now - take a peek a the actual photo. Our first projects doing interactive walls were based on electric field (capacitive) sensing - see the Gesture Wall System that we did for the Brain Opera. Optical Tracking for Music and Dance Performance J. Paradiso, F. Sparacino, in "Optical 3-D Measurement Techniques IV", A. Gruen, H. Kahmen eds., Herbert Wichmann Verlag, Heidelberg Germany, pp. 11-18 (1997). 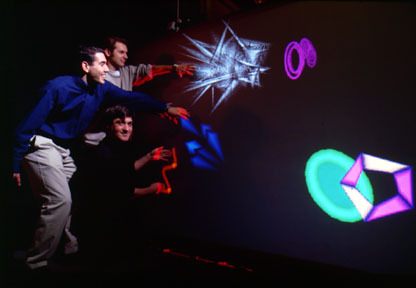 Tracking Hands Above Large Interactive Surfaces with a Low-Cost Scanning Laser Rangefinder Joshua Strickon, Joseph Paradiso. In CHI98; Extended Abstracts, ACM Press, NY, April 1998, pp. 231-232. Sensor Systems for Interactive Surfaces. J. Paradiso, K. Hsiao, J. Strickon, J. Lifton, and A. Adler, IBM Systems Journal, Volume 39, Nos. 3 & 4, October 2000, pp. 892-914. Joshua A. Strickon -- Design and HCI Applications of a Low-Cost Scanning Laser Rangefinder. January 1999. Christopher Yang -- New Laser Rangefinder Designs for Tracking Hands Atop Large Interactive Surfaces. March 2001.